Wasps’ netball director Tamsin Greenway. WASPS bounced back from successive Vitality Superleague defeats to record an emphatic victory in Cardiff. Tamsin Greenway made several changes to her starting seven and the gamble paid off with her side dominant from first centre-pass against Celtic Dragons. The victory puts Wasps back level with Loughborough Lightning at the top of the table with one game in hand over their East Midlands rivals. “We knew we had to go there and make a statement and we did just that,” said netball director Greenway. “Losing the last two games was a reality check and we came here to Cardiff, got the win and proved what we are capable of. “We changed our combinations and made some changes that gave us more in the attacking end – the little tweaks paid dividends. “I think this win has taken the pressure off a bit, but it is a long season and it’s far from finished yet. “The last two weeks proved you can’t take your foot off the pedal. Wasps opened the game with Sophia Candappa and Natalie Haythornthwaite moved to goal attack, with Greenway introduced herself at wing attack as she looked to end her team’s losing run. The visitors started fast and a series of free-flowing attacking moves saw them leading by four within minutes. A highlight interception from Greenway midway through the first quarter typified Wasps’ start the game, with high-pressure all over the court and forcing Dragons into mistakes. Fran Williams and Hannah Knights combined well in defence to disrupt the home team’s attack, helping their side push to a double figure lead to close the first quarter. 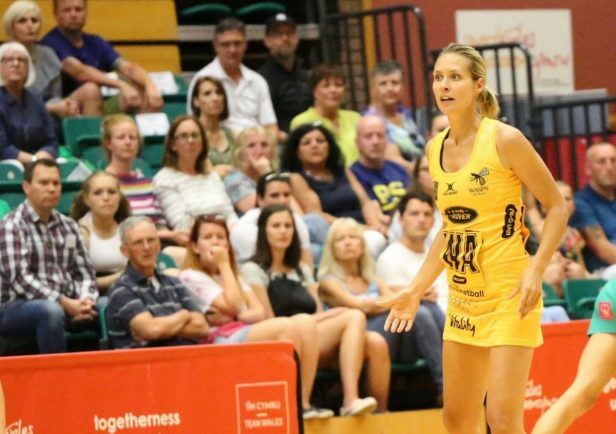 The hosts continued to struggle in the second quarter, with Wasps continuing to play fast, attacking netball. England international Haythornthwaite showed her class and shined in her new goal attack role. Her passing throughout the second quarter impressed, consistently finding George Fisher for goal-scoring opportunities. Experienced players Sam May, Rachel Dunn and Josie Huckle were introduced after the break as the black-and-golds looked to press their advantage. Haythornthwaite was again the star, driving into the circle time after time and extending the visitors’ lead to 25 with the assistance of recently introduced Dunn. By the start of the final quarter Wasps had scored double the goals of their opponents and played with the confidence that the win was secured during the final 15 minutes. Lucy Harris was introduced to end the game, linking up well with Candappa and created multiple opportunities for goal shooter Dunn and cemented the victory. Wasps’ next home fixture sees them face Mavericks on Monday, June 18.